The CMO-CIO relationship still needs to evolve further to support new innovation and intelligent risk-taking that actually bears fruit. Well over a decade ago, before the dot-com boom, there was a wide gulf between marketing and IT teams. When the digital revolution first began, CMOs and CIOs began an earnest collaboration due to necessity. They had to work together to drive the earliest stages of digital transformation throughout their organisations. Fast forward to 2017, and the process of digital transformation has only grown more complicated and arduous. The marketing stack has become exceedingly complex. Data is spread across various silos and inputs, and teams need to find a way to correlate and rationalise it into actionable insights. Extending marketing into the customer experience and making moments of impact that matter requires people and technology that not only understand the “who” and the “what,” but also take into consideration time, place, immediacy and goals. In the context of this brave new technology-fuelled world, many say that the role of the CMO and CIO are merging into one. I respectfully disagree. The CMO is still the big picture dreamer with an audacious goal in mind while the CIO remains the hard-working tinkerer who must execute the big vision. But the CMO-CIO relationship still needs to evolve further to support new innovation and intelligent risk-taking that actually bears fruit. How can the two diverse parties better understand one another against a backdrop of constant pressure to outpace competitors and engage increasingly flighty consumers? IT has become inextricably intertwined with marketing efforts. Mobile has become the dominant consumer engagement point, and IoT is increasingly creating new interactions with consumers. The future of customer experience, loyalty and brand engagement is about leveraging technology to create ecosystems around your product or service. Evidence of this is all around us. Through iCloud, iTunes and the AppStore, Apple has created a robust and vibrant ecosystem for all of its products and services. Through Prime and Kindle, Amazon has galvanised its lead in the retail shopping experience. These budding yet massive ecosystems are to the future what malls and box stores were to the past. Viewing personalised content and consumer reviews is the modern equivalent of window shopping and browsing the racks. Social networks provide the same hangout space and consumer integration as the halls, corridors and food courts of the past. Seeing, touching and trying now happens in the home, not in-store, meaning the cost for delivering the product – physically or digitally – is expected to be the same. Allowing for free shipping and returns is simply table stakes. With 3D printing and future in-home-fabrication, the definition of manufacturing and delivery will blur. Products will be accessible and near-real time, and simple products will be nearly free, with the ecosystem and experience being the key differentiators. When it comes to the customer experience, automation and artificial intelligence (AI) are taking hold. In their early years, they represented a way to get access to good and repeatable service, on the consumer's terms. In the future, they will predict emotion, happiness and need, based on a variety of inputs. Consumer expectations around real-time interaction will increase, and the difference between human and digital engagement will whittle down to nothing. In this new context, dumb retail is dead. Bad marketing kills. It is instead about creating new spaces, where the digital and physical collide, to enhance value for the consumer and maximise economies of scale for the brand. The survivors are those recognising how to embrace, adopt and leverage technology; modelling the clay of a consumer master piece. And, in that task, both the CMO and CIO still have pivotal roles to play. In this new space, the CMO is the designer. By leveraging combinations of technologies, new channels, content and experiences, they work to create ecosystems for their consumers. The CMO will be responsible for proving the value of the ecosystem – both to the consumer and to the brand – by leveraging big data and real-time analytics. Adjustments will happen daily, and when given the right technology to work with, every day represents a new opportunity to leverage the ecosystem at scale. The CIO, however, is the gatekeeper to the new technology – the innovator, the actuator. Their job is leveraging more accessible technology to create economies of scale. They are also tasked – at least in part – with finding the right talent to deploy in order to create the most optimal consumer experience. Without the CIO, the CMO is simply a conductor without an orchestra. A coach without a quarterback. Achieving a balance between the new roles of the CMO and CIO must not overlook the obvious challenges. Companies have invested years of capital, effort and time into their current technology and marketing stacks. Long-standing companies and traditional brick-and-mortar businesses are not given the budgets and luxury to transition off of legacy systems and onto complete new tech. This gives them a distinct disadvantage compared to new, agile and disruptive digital competitors. When it comes time for a digital transformation – be it driven by marketing or other business needs – businesses often find themselves facing a pile of technical debt. They’ve adopted new technologies piecemeal, and have ended up with Frankenstein solutions that are unintelligible to new talent entering the IT department. At that point, those left behind have no choice but to make sweeping changes that will inevitably impact every facet of the business. Facing this challenge, some of the world’s leading brands are taking a unique approach. They’re creating incremental transitions from their data warehouse using something called a customer data platform. These platforms operationalise customer data in the cloud, and allow the company to create a contract for accessibility, reliability, security and access control. With this one step, organisations are immediately enhancing their ability to integrate with newer and more effective cloud-based technologies, modern data warehouses, BI tools, advanced AI and analytics; without taking on the burden of architecting a completely new marketing and CRM stack. World-class organisations deserve world-class technologies and shouldn’t settle for anything less (and can’t afford to either). However, being successful in business requires being successful in marketing, which requires technology that’s fast, agile, sleek and built to last. 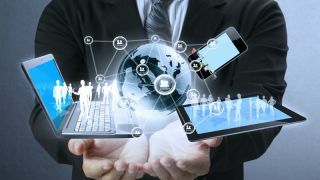 Though they may not always see eye-to-eye, the goals of the CMO and the CIO are tightly-connected. The accessibility that technology creates and how that technology is deployed will entirely depend on the relationship between the CMO-CIO pair and how closely the can collaborate.